N is for nutrition, It’s important what you eat. Never neglect healthy eating, Even after you compete. Have you ever wrestled with the idea of wrestling? 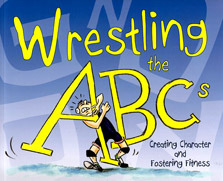 Wrestling the ABCs brings the sport of wrestling to life for children in rhyme. Full of helpful explanations and lively illustrations, this book helps parents explain wrestling in a fun and engaging way. Wrestling the ABCs teaches life skills including sportsmanship, discipline, nutrition, fitness, teamwork, and motivation.